I just received a copy of the video shot during last week’s demo. It’s long, and also pretty entertaining. Chris Carter Demo 2013 from John Wolff on Vimeo. Thank you Essex Water Color Club! Last day of a road trip vacati0n…. Tom is already asleep …. I was ten stories up reflecting on the last seven days on the road. I love those precious moments when I realize, and accept, that progress has been made. I brought along gouache, but didn’t squeeze it out into the pans until last night, listening to the sound of the ocean waves breaking against the beach. 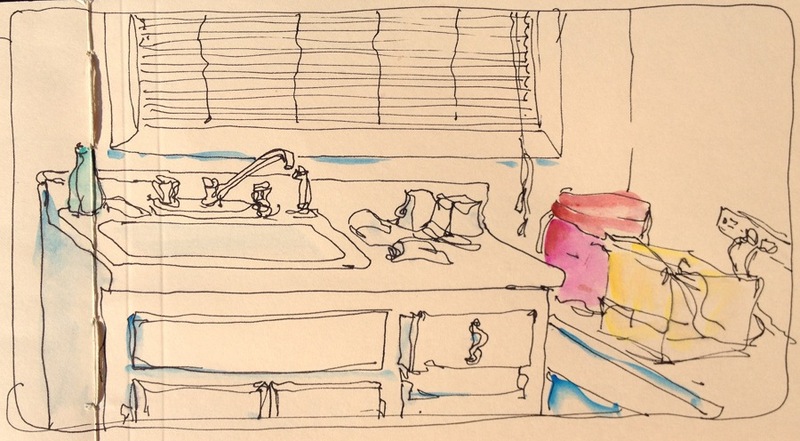 I brushed a bit of color onto the ink drawing I did of the kitchen in the motel room in the Outer Banks, NC. This is my first weather journal painting in gouache. My second was of three figures on the beach, out early to watch the sun rise. I wish they knew that their special moment was captured in my sketchbook….. but I don’t know them and they will never know…. One figure snapping a photo of the other two figures against the sunrise in Ocean City, Maryland …. gouache. Color has taken on a new place in my vision….. I’m not sure where that place is. 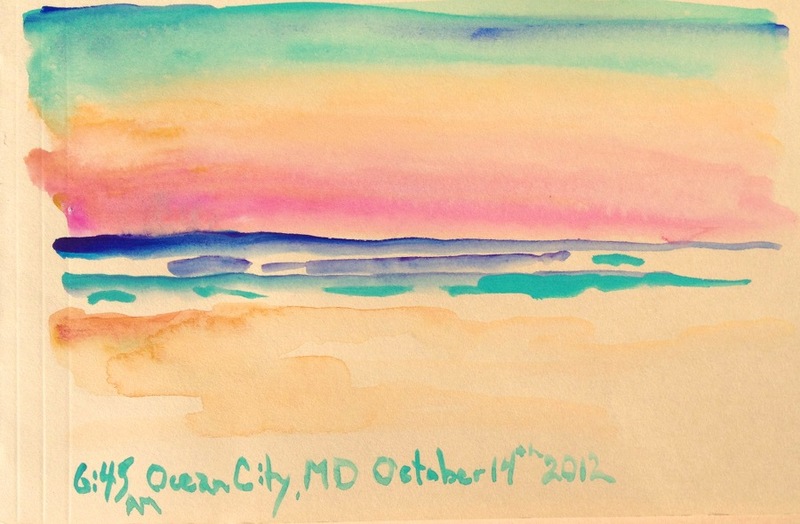 In a week I leave on another journey… back to the Chesapeake Bay area to paint for six days…… Hmmmm. Do I bring watercolors and gouache? Oil paints? Acrylics? I am finally mixing my pigments intuitively. 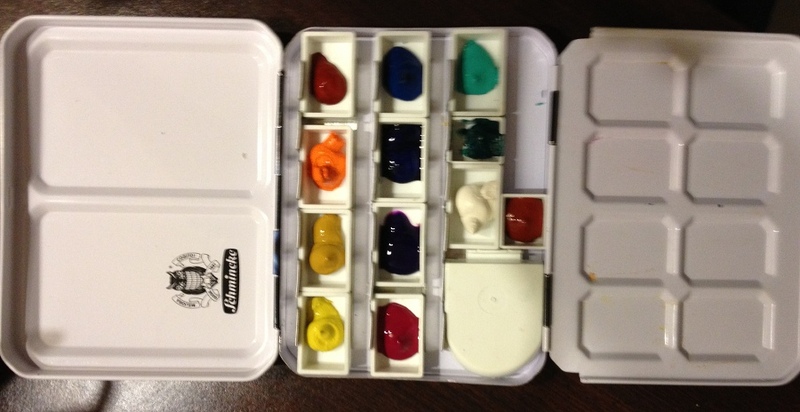 I need to stay healthy for another thirty years, at least….. the joy of color is just beginning! 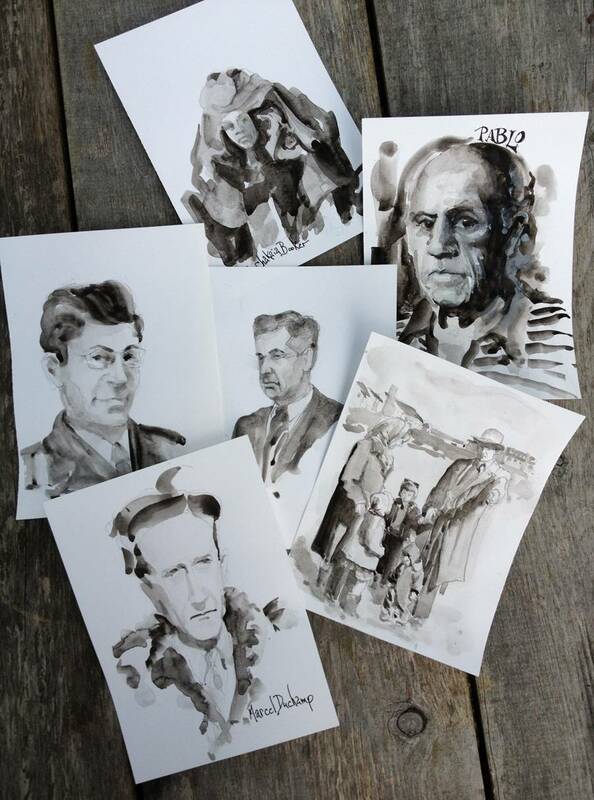 I’ve been working on monochromatic watercolor portraits from photographic references. It is painful. I much prefer to work from life than to work from a photograph. However, I am focusing on creating solid head form and I need to go back to square one. Photos are the most efficient way to begin again. I began working from a pile of magazine clippings I found when cleaning out my files. I have moved on to family albums. I had to work into this one with a bit of white gouache to bring back some of the form I lost on the shadow side of the face. This is my favorite. I like the simplicity of line and value shapes. 1952. My father pointing out to us where our house would be built. I’m the little one in the snowsuit, staring at the ground. There was a big back hoe behind my dad in the photograph. As much as I love land moving equipment, it would have complicated the shapes if I included it. After two days of monochromatic painting using ivory black, I had to dip into color. I look a bit cross-eyed in this painting. I was feeling a bit cross-eyed as I painted it. The inspiration for my focus on improving skills at portraiture came from the trouble I have painting female musicians during the blues jams. Regardless of age, female faces are generally softer, the transitions of planes and forms are more subtle than than male faces. 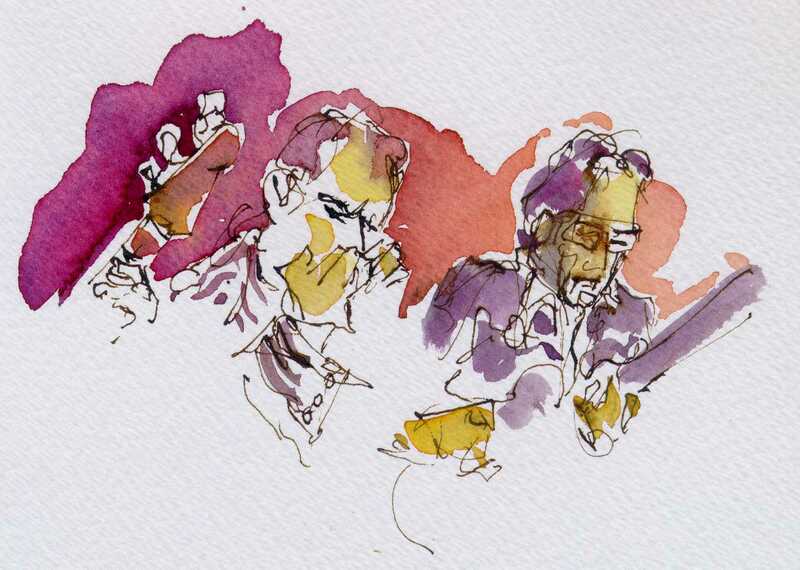 Originally, I didn’t care that much about creating a likeness when I paint in the dark at pubs, I was more concerned about capturing a sense of the musicians movements and energy. 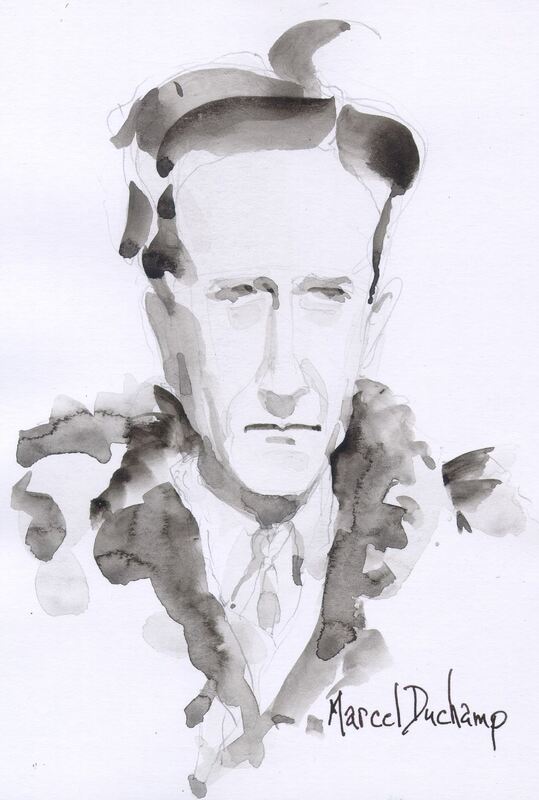 When I did capture a likeness, I felt a great sense of satisfaction. I want more of that feeling. 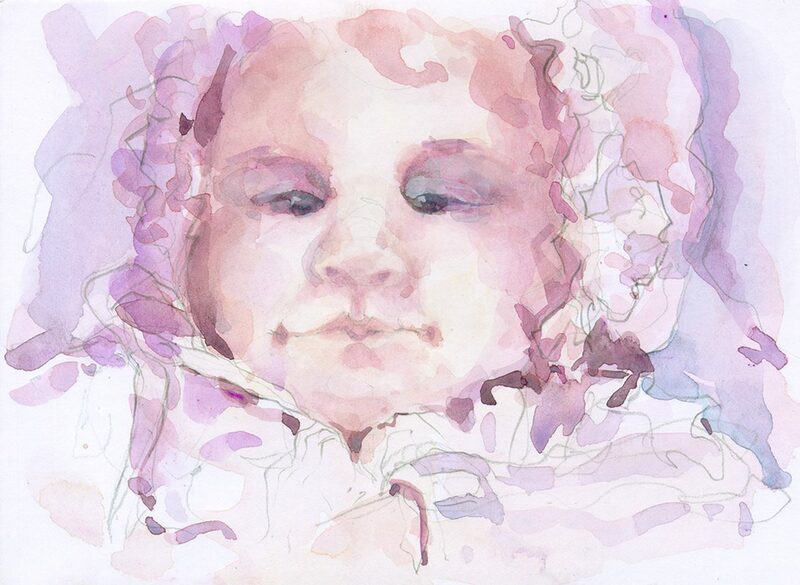 So ….. it’s back to the drawing board to refresh and improve my portraiture skills. 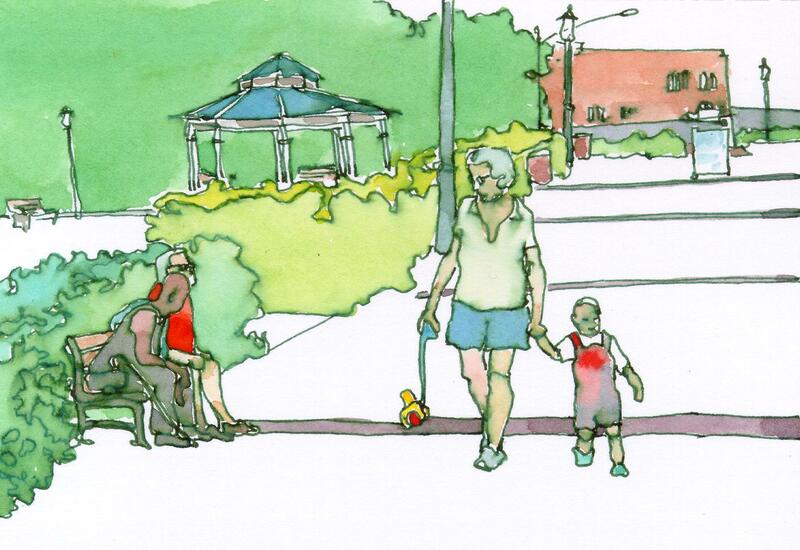 After sifting through the photos I shot in Keyport yesterday, I forced myself to do a quick sketch from one of them. I don’t enjoy working from photographs. They don’t give me information regarding color, values or the energy of the places I’ve been. Maybe I’m just a got-to-be-there snob. What I decided is that I need to know what it is I want from my plein air paintings and why I am entering the weekend Plein Air Events in my area. My intention was to visit the harbor prior to next weekend’s event in order to decide where I want to set up. Driving home, I thought only of the people I met, not of the boats floating in the water or the landscape. When I tossed the die to see what color scheme would be chosen for me, it came up Extended Analogous Color Scheme with Green as my dominant color. That would have been fine if there hadn’t been people in the image. The last thing I wanted to do was to have the people disappear into the shrubbery. Sometimes rules work and sometimes they don’t. My plan is to work from the photos all week. Hopefully, I’ll get over my aversion to them and have a better idea of where I want to be next weekend. Only the paintings done during the weekend event may be entered in the event exhibition or competition (if there is one). I look forward to seeing the two men on the bench, Joe, Don and Judy Pie (the tiny dog hidden under the bench) next weekend. They told me they would save me a spot on the bench in case I want to sit down when I’m painting next weekend. I just might take them up on their offer. 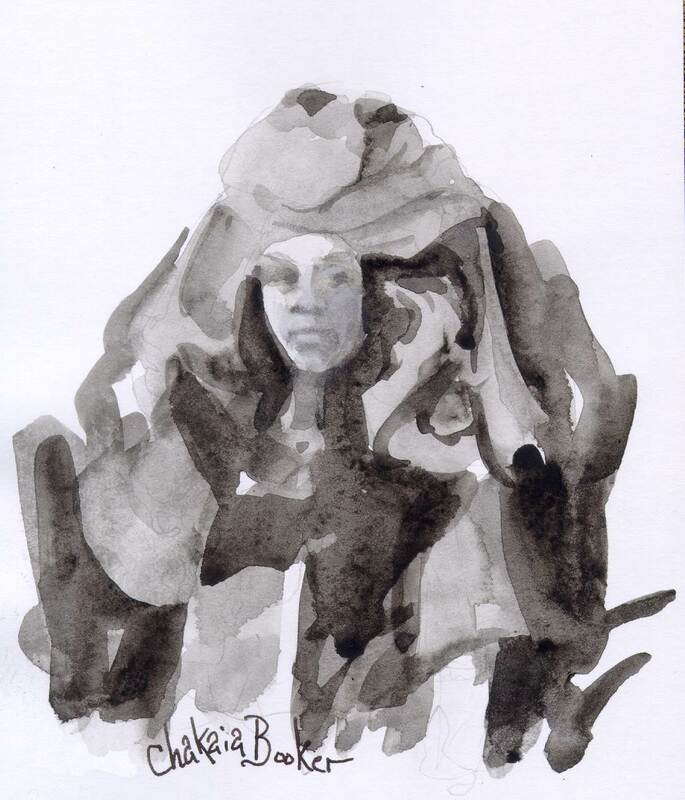 Drawing: Working from a photograph rather than life …. drawn first with fountain pen, followed by watercolor. Adjacent Double Near Complements may not be an official Color Scheme but it is one I find I intuitively use quite often. I generally choose either the warm half of the color wheel (skipping the center two hues) or the cool half of the color wheel (skipping the center two hues). It works well with the in-between colors as well. Pick any two adjacent two colors, skip the next two colors in either direction and use the next two colors. It’s simple and it is beautiful. 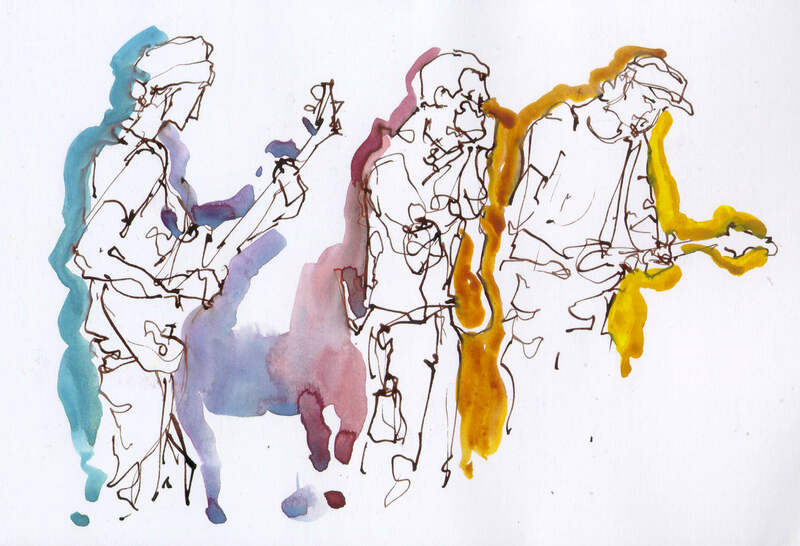 This painting, created during the January 30, 2012 Blues Jam at The Grisly Pear in the West Village, illustrates the ADNC color scheme. (Violet, Red Violet, Orange Yellow and Yellow. 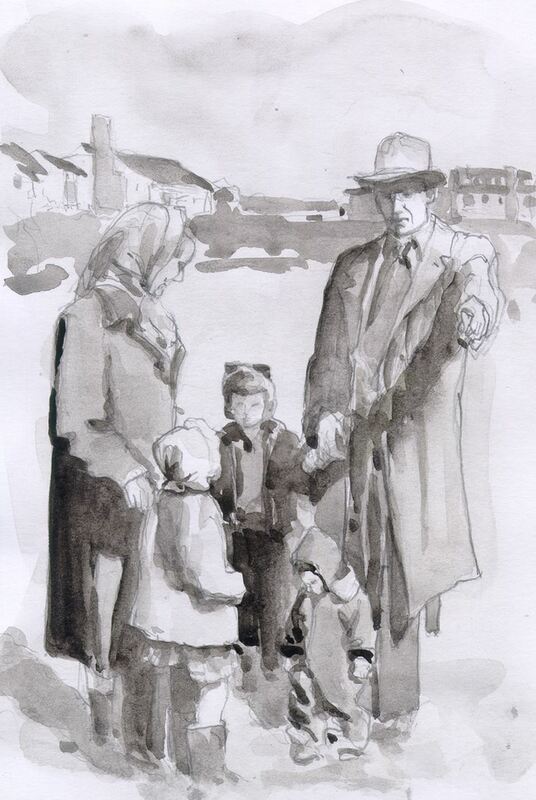 Drawn first with dip pen and black ink, followed by watercolor. 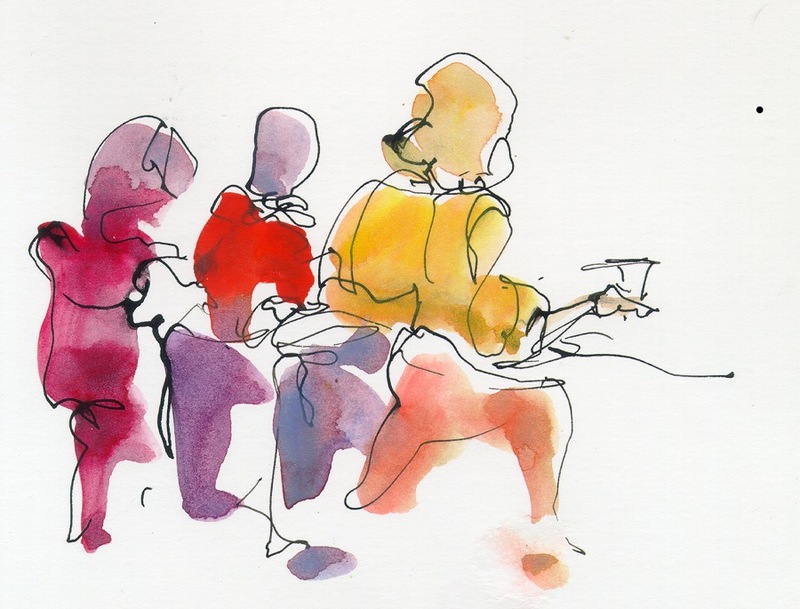 When painting dancers or musicians during a performance there is no time to contemplate what I’m drawing, what colors I’m using or even why I think I can express the energy of the moment in less than a minute with a pen and a brush. 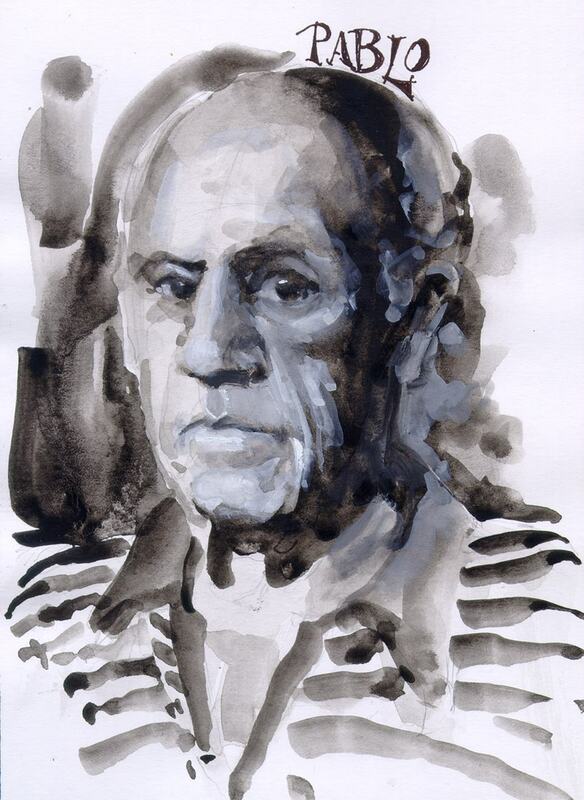 I paint whatever grabs my attention and provides me with a starting point. The Saucon Valley High School Jazz Ensemble won second place in the High School Jazz Band competition at SteelStacks in Bethlehem, PA. As a reward, they opened for Kevin Eubanks last Friday evening. I was given a table to paint on at the back of the room giving me front, slightly distant view of the stage. 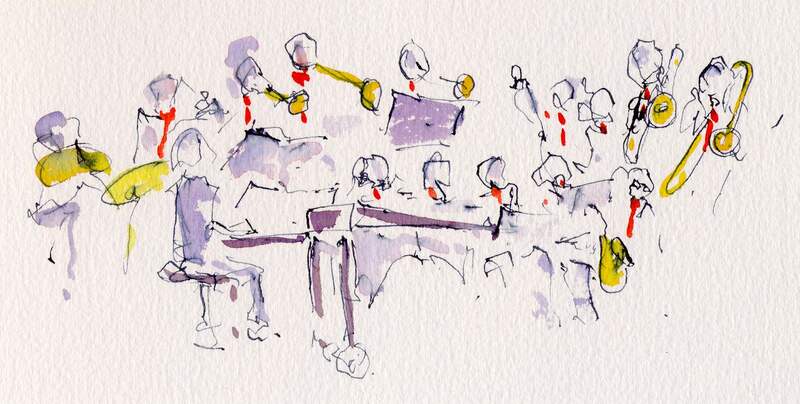 What I saw was a mass of musicians dressed in black sitting on black chairs behind black music stands. 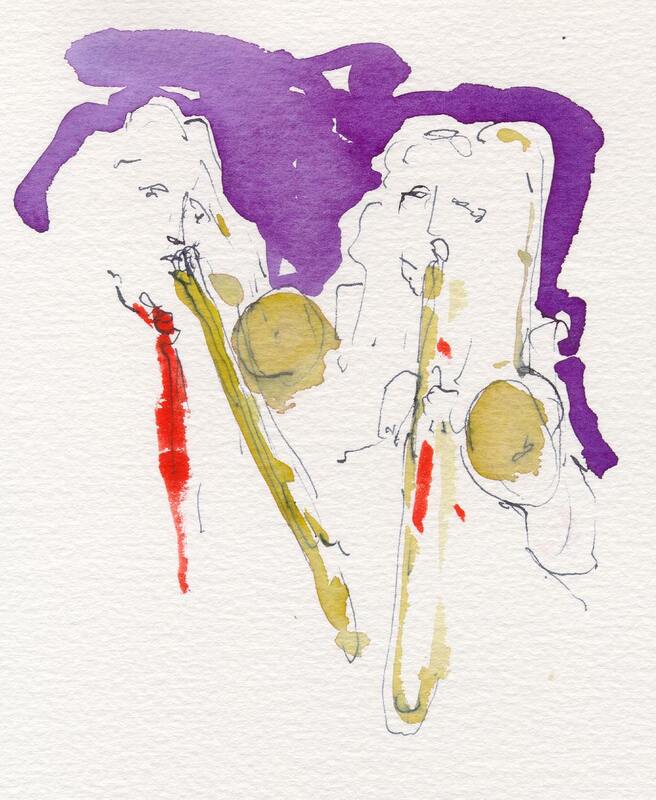 The only shapes that stood out were the brass instruments as the stage lights struck them and ……. the bright red neckties worn by each of the band members. A little bit of color can go a long way to save the day.